This years winner of the Stella Prize has been announced. In The Strays, Evan Trentham is the wild child of the Melbourne art world of the 1930s. He and his captivating wife, Helena, attempt to carve out their own small niche, to escape the stifling conservatism they see around them, by gathering together other like-minded artists. They create a utopian circle within their family home, offering these young artists a place to live and work, and the mixed benefits of being associated with the infamous Evan. At the periphery of this circle is Lily Struthers, the best friend of Evan and Helena’s daughter Eva. Lily is infatuated by the world she bears witness to, and longs to be part of this enthralling makeshift family. As Lily observes years later, looking back on events that she still carries painfully within her, the story of this groundbreaking circle involved the same themes as Evan Trentham’s art: Faustian bargains and terrible recompense; spectacular fortunes and falls from grace. Yet it was not Evan, nor the other artists he gathered around him, but his own daughters, who paid the debt that was owing. 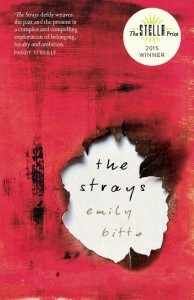 This entry was posted in Awards & Prize Lists, Fiction and tagged Emily Bitto, Stella Prize 2015, the strays by admin. Bookmark the permalink.